After battling and surviving a rare and aggressive form of breast cancer, Sally Obermeder decided she wanted to take back control of her life. She decided to make a simple change, and so began her green smoothie transition. She lost over 22 lbs, got her skin glowing, ramped up her energy levels, and ultimately realized this small change to her lifestyle resulted in her feeling the best she'd ever felt. The green smoothie revolution has taken the world by storm, and Sally has spent the last year testing and creating hundreds of crazy delicious green smoothie recipes that taste nothing like soggy spinach and everything like an exploding taste sensation. The recipes are easy to follow and easy to make. From savory to sweet, green to red, vegetable to fruit, breakfast to dessert, there's a smoothie to suit every taste and every age, and even kids. Sally's smoothies are packed full of goodness for maximum benefits—think leafy greens, fresh veggies and fruits, as well as added vitamins, minerals, nutrients, and superfoods that help to leave you feeling full for hours and stop those cravings for sugar as well as unhealthy, fatty foods and snacks. 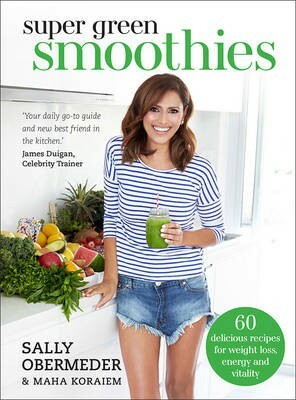 The recipes in Super Green Smoothies will help you to kick-start your health transition, just like Sally did, and will help you to look and feel great—inside and out, all year round. Recipes include dual measurements.